Student-athletes face additional challenges with back-to-school season, such as less sleep due to homework and extracurricular activities. So anytime we can introduce “two-for-one” deals that make their lives easier in any of their academics, sports, and other life arenas, we score a victory. A sound nutrition program helps provide that balance, since the same foods that contribute to your young athlete’s athletic performance also build a healthy immune system – who wouldn’t want that kind of win? Teen athletes not only need extra calories, but extra quality calories, to meet the demands of their sport and to support their growing bodies. And while aiming for nutrition that fuels athletic performance and development is a good thing, aiming for nutrition that fuels them on the playing field and their physical growth while preventing injury and illness is a great thing. Many of us think in terms of how quality nutrition can contribute to athletic performance: by developing healthy red blood cells for efficient oxygen delivery to cells; refilling glycogen stores so that muscles can perform longer; and building muscle fibers so that they grow bigger, stronger, and capable of a higher level of play. On the flip side (though equally as important), we may not often consider what proper nutrition helps us avoid: injury and illness. We may not be able to easily count the number of times that an athlete doesn’t catch a wicked virus or avoids the pitfalls of dehydration. However, we can easily spot those players who are focused, in top physical shape, and “performing at premium.” A healthy diet can certainly yield all of these benefits, no matter whether they’re easily visible or not. Therefore, consider proper nutrition as one of the most effective, affordable, and simple forms of “health insurance” that exists! 1) Hydration – Maintaining proper fluid balance to avoid dehydration, overheating, fatigue, and more severely, heat exhaustion, heat cramps, or heat stroke is key. Trick question: which water intake in the most important to ensuring that one is hydrated: (a) the days leading up to a major event, (b) fluid intake immediately before the event, (c) during the practice or game, or (d) following the activity? Answer: the whole glass! Sipping the days, hours, and minutes before, during, and after directly contributes to well-being…in short, all the time! More specifically, athletes generally do fine on plain water if an activity runs 60 minutes or less; for events that run 90+ minutes, an electrolyte replacement beverage (diluted is ok) will keep glycogen stores from becoming depleted. 2) Adequate Caloric Input = Quality Performance Output – Caloric needs vary widely among adolescents and, appropriate intake is critical to playing at top level. Too few calories and the athlete feels fatigued; too many and s/he may feel sluggish. Working with a nutrition professional or your physician can help you pinpoint the caloric needs for your teen athlete in order to provide adequate energy during training and competition. 3) Balanced Diet – A balanced, varied diet should provide all the necessary nutrients (carbohydrates, fats, protein, minerals, vitamins, water, etc.) to support growth and development, regulate metabolism, boost the immune system, and assist with all bodily functions. As a result, the athlete improves his/her chances for avoiding vitamin/mineral deficiencies. After all, he can’t do the team or athletic event much good if he’s too sick to make it to the playing field…or if she undernourished. Carbohydrates – Besides circulating blood sugar, energy stored as glycogen in the liver and muscles will need to be replaced by carbohydrates in diet, and preferably within an hour or two following exercise. If glycogen levels aren’t replenished, early fatigue, lower exercise intensity, and increased chances for injury & illness may result, according to Toni Tickel Branner, M.A. Protein – Protein aids in repairing body tissues, making hormones, enzymes, and antibodies, plus transporting fluids and energy. And while many athletes constantly strive to boost their protein intake, many health experts agree that protein insufficiency rarely occurs. On the other hand, too much protein (including protein from poor-quality sources) is more common and places a strain on the kidneys. Fat – Necessary for supporting heart and brain health, preserving cell membranes and skin, making hormones, and transporting certain vitamins, healthy fats can be found in monounsaturated fats (olive oil) and Omega-3 fatty acids (salmon or tuna). *Note: Calcium isn’t effective without vitamin D, which can be found in orange juice, soy milk, fortified cereals, egg yolks, salmon, & sardines…or obtained by 15-20 minutes of sunshine. 5) Training on Treats – There’s a time and place for everything, whether we’re talking about plays on the field or treats off the field. Some of teens’ preferred snacks often steal the place of higher-quality foods that offer more nutrients and health-boosting effects. Limiting less-than-optimal choices in favor of healthier snacks most of the time may contribute to a top-notch game. Athletes committed to their wellness on and off the court consistently ask, “Is this choice ‘for the benefit of’ or ‘at the expense of’ the goals I want to achieve?” As a result, they’ll be more likely to avoid illness and injury, plus play at a higher level, especially in the last minutes of the game. 6) “Eat the Rainbow” – Will Lane, M.D., suggests eating a variety of fruits and vegetables from all colors of the produce spectrum. As athletes increase their physical activity, so does their levels of oxidative stress and production of free radicals. To combat the potential damage to cells, he suggests consuming antioxidants through whole food, specifically, fruits and vegetables. 7) Bridging the Gap with a Whole-Foods Supplement – Is your teen consuming the recommended amount of 9-13 servings of fruits and vegetables each day? If you’re like most, busy schedules and general lifestyle demands pose major orchard and garden challenges! As mentioned earlier, athletes have increased needs for quality nutrition because they produce more free radicals than others. Without adequate antioxidants, phytochemicals, and phytonutrients to stop oxidative stress, damage may occur to muscle fibers, red blood cells, cell membranes, and proteins…therefore resulting in muscle fatigue, injury, and susceptibility to illness. Therefore, you may consider a whole-foods supplement to help bridge the gap between what your teen is consuming and what s/he needs. Peer-reviewed research shows that isolated, man-made vitamins have not been found to be effective in lowering oxidative stress except in higher toxic doses (which may cause side effects like kidney damage). Conversely, whole-foods supplements like Juice Plus+ have been shown to enhance immune function, improve circulation, reduce inflammation, and reduce oxidative stress. Classified as a whole foods rather than a supplement, you may wish to consider this option to round out your nutrition, increase nutrient absorption, and outlast the competition! Because the general guidelines for the young athlete also work for the rest of the family, it’s an opportunity to adopt a “team” approach when managing your family’s nutrition. Apart from physical benefits, remember that your young athlete’s mental health remains as important. Supporting your child without pressure is critical in building healthy attitudes about nutrition. Approach him or her with positivity and avoid the battleground associated with a “good” vs. “evil” food philosophy. Instead, offer encouragement and congratulations, especially when s/he makes sound food choices. Finally, considering all of the time that athletes invest in training, they deserve the same level of education when it comes to nutrition. Paying close attention to food choices can help ensure maximal performance – most importantly, through the final seconds of the game. Jodi Sheakley, MS, CFT, is the founder of Nutrivita Wellness, a healthy living consulting practice. She works extensively with family nutrition, weight management, nutrition for athletes, and whole-foods supplements. For more information, email jodi@nutrivitawellness.com or call 704.965.0785. We’ve all heard complaints about coaches who don’t do enough. (“He barely said a word all season! The kids didn’t learn anything!”) But is there a down side to coaches who coach too much? Is it possible that at the youth level we can do so much coaching we actually create an environment where players are not taught to think for themselves? My daughter spent four years playing soccer for a particular coach. During those four years, their team was State Cup champion one season, runner-up another, and always in the top three or four in the state. This coach had a tremendous knack for seeing play on the field develop before the players did. Consequently as a pass was coming to a girl he might yell, “Maddie’s on!” or “Service!” or “Shot!”, essentially making decisions for the girls before they could. I was concerned that once they got a new coach they might be paralyzed with indecision if no one was moving them around like puppets. However, now that they do have a new coach, (who also directs play from the sideline, though to a lesser degree), it is apparent they can make their own decisions. When the new coach gives a “suggestion,” such as “Find Sarah,” while the players usually follow the instruction, I’ve noticed that many times they choose to do something else, (to which the coach will typically say, “Good decision.”). When I coached Little League, because of my experience on the field, I also could see plays developing a split-second faster than the players. So, many times as soon as the ball left the bat, I might be telling the fielder to whom it was hit, “Four! Four!” so he knew to field the ball and throw home. Because one split-second indecision could be the difference between safe or out, I didn’t want to chance the player not knowing what to do when the ball arrived. However, I often wondered if I was doing that because it was in the best interests of the player’s long-term development, or if it was done more so we had a better chance of winning. I’m sure there are many who would say, “If you prepare them well at practice, you shouldn’t have to direct them on the field.” The thought is that if you’re a good enough coach during practice, it is unnecessary to say a word during the game. The team knows what to do and you can sit back in your chair and watch them effortlessly execute the plan. And while that may work at some of the most elite levels of sports, I doubt anyone coaching nine, ten, eleven and twelve year-olds, with a couple hours of practice per week, can accomplish this. So, when that ground ball is hit to the shortstop and the runner on third surprises everyone by breaking for home, would it be better to wait the extra second for the players to see it and let them all yell, “Four!” even if that means the runner will be safe? Some may think so. They may believe this is the only way the kids will truly learn to think for themselves so that they can function later on in their careers when they don’t have you there to direct them. I’m not convinced. Just as the girls on my daughter’s soccer team seem very capable of independent thought even with a new coach, I’ve been told some of the kids I coached who are now in high school and college have a very high “Baseball IQ.” I don’t know if I can take credit for that. But it seems my coaching didn’t stunt their development on the mental side either. In fact, when the ball is hit to them now, I wonder if they still hear the old coach telling them what to do, even though we haven’t been on the field together in years. When you are out working on pitching mechanics this off season, take some time and work on your torque. It’s the key to throwing deep into games as well as improved velocity. This past week I was out at a local baseball training facility working with a bunch of youth pitchers on pitching mechanics. We were focusing on the lower half of the body (waist down pitching mechanics) and looking at some video clips of Big League pitchers. The purpose was to crack the code so to speak and figure out how these guys created so much velocity and torque that allowed them to whip the ball towards home plate. After the 30 minutes of watching these video clips and explaining, all of the pitchers, ages 10-18 were seeing the secret all Major League Pitchers understand. It’s the technique of creating torque. There are two points that need to be accomplished while working on pitching mechanics in order to increase torque and pitching velocity. 1. The Leg Lift: Most all youth pitchers I’ve instructed on pitching mechanics understand that lifting your leg into the balance position is an important step. We modified the process slightly. Instead of bringing the front leg up into a balanced position with the knee pointing in the same direction as the chest, we turned in the leg some to close the lower-half of the body off even more. This slight twisting motion, or coiling, prepares the body for the second and most valuable torque- creating technique. Take a look at the picture of Harden (above left) for a visual of this step. 2. Delayed Shoulder Rotation: The second part of the torque process will take some more time to work on during your pitching mechanics training. However, once our pitchers worked through the mechanics, they immediately felt less tension on their throwing arm as their body acted like a giant sling shot. Upon landing with the front foot, the front foot and front knee should be turned towards home plate. The hips will be slightly open, and the chest and front shoulder should remain closed off and not open at all towards the catcher. The longer my guys were able to keep the upper body from rotating, the more whip action they were able to create. Dan Gazaway is Owner and Founder of The Pitching Academy. 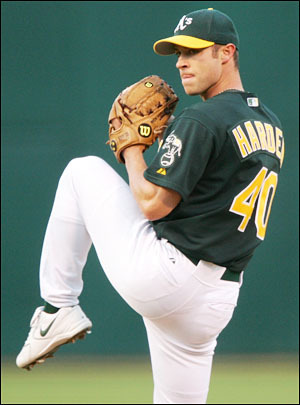 He has instructed over 2,000 pitchers in the last seven years and received a Bachelor’s Degree as a Health Education Specialist at Utah State University. He is a motivational speaker for topics ranging from attitude, goal-setting and leadership and be contacted at contact@thepitchingacademy.net. As youth coaches, our jobs are to do more than just coach the X’s and O’s. Great coaches try to instill character, sportsmanship, work ethic and other qualities in their players. No one better exemplified this than John Wooden, whose players not only learned excellent basketball fundamentals, but extremely valuable life lessons as well. It would be a challenge for anyone to live up to Wooden’s Nine Promises that can Bring Happiness every day in every way, but imagine a world if everyone did. 1. Promise yourself that you will talk health, happiness, and prosperity as often as possible. 3. Promise to think only of the best, to work only for the best, and to expect only the best in yourself and others. 4. Promise to be just as enthusiastic about the success of others as you are about your own. 5. Promise yourself to be strong so that nothing can disturb your peace of mind. 6. Promise to forget the mistakes of the past and press on to greater achievements in the future. 7. Promise to wear a cheerful appearance at all times and give every person you meet a smile. 8. Promise to give so much time improving yourself that you have no time to criticize others. 9. Promise to be too large for worry, too noble for anger, to strong for fear, and too happy to permit trouble to press on you. Why Do Kids Quit Baseball for Other Sports? There are many reasons kids quit playing sports. Over-competitive coaches, fear of injury, feelings of failure and other issues can cause kids to opt out for other, non-athletic interests. But how do we explain kids who are still interested in sports, but just not baseball? Why do so many kids who love sports and love competition choose to channel those feelings in other directions? The answer you’ll hear most often is that baseball, by nature, is a slower game than, say, soccer or lacrosse. Parents of kids who quit baseball say things like, “He just needed more stimulation. There’s too much standing around in baseball.” And there is plenty of truth to that, because in soccer, hockey, lacrosse and basketball it is much easier to scrimmage. Even the most inexperienced basketball coach who has eight kids show up for practice can fill much the allotted time with a 4 on 4 game. The kids might not have learned much from a fundamentals standpoint, but when they get in the car to go home, they’ll tell their parents they had fun. One can’t really run a 4 on 4 scrimmage in baseball. So if that same coach has a baseball team and eight kids show up, he may spend that time pitching batting practice to one kid at a time while the other seven chase balls and throw them in. Compared to a fun scrimmage, a practice like this seems like drudgery. By and large, kids don’t quit baseball because they’re bored at games – they quit because they’re bored at practice. Don’t get me wrong. Practice isn’t supposed to be just amusement. But think about a job you may have had (or currently have), that was actually kind of fun. Sure, you were working and getting things done, but it was more of a pleasure than a chore. Why can’t we make our practices the same way? Just because we’re teaching fundamentals doesn’t mean we can’t make it enjoyable as well. Here’s an example of what I mean: I can’t tell you how many times I’ve walked by a baseball diamond and seen a coach with eight kids out in center field, and, one-by-one, they step out from the line so he can hit them a fly ball. If they drop it – no big deal. They just pick it up and throw it in. If it’s a bad throw the coach might tell them to make a good throw, but there really are no consequences. Meanwhile, seven kids are always standing still, bored stiff. Instead, why not divide that same group of eight kids into two teams? The kids get one point for their team by making a good catch and another point for a good, one-hop throw. First team to thirty wins. Now, in exactly the same drill, all eight kids are competing, and when that score is 24-23 and the ball is in the air, they’re cheering and excited. And when the drill is over, they want to do it again. But maybe most importantly, what you’ve also done by conducting the drill in this manner, is to simulate game competition. Now, when one of those players has a fly ball hit to them in left field with a runner on third and one out, they’ve been there before. They’ve experienced the same pressure in a practice setting and thus, are more likely to perform. We’ve tried to build this coaching philosophy into CoachDeck. Beyond being a simple pack of 52 good, fundamental drills, each card has a unique, “Make it a Game,” feature that turns an ordinary drill into a fun and exciting competition kids will love. We believe this is one of the reasons that leagues using CoachDeck are reporting that more kids are coming back to play year-after-year. This obviously means more registrations and a healthier bottom line for the league. In this way, leagues using CoachDeck tell us they don’t look at CoachDeck as a luxury, but as an investment that pays dividends. Which is all nice. But our bottom line is that more kids are playing baseball – and sticking with it. If we can have a little to do with that happening, than that makes coming to work a little more fun for us too. Another great article by Rick Reilly from ESPN.com. Jane Lang is blind, yet makes a 2 1/2 hour trek, 30 times a year to see her beloved Yankees play, accompanied only by her guide dog, Clipper. On her most recent trip, she was accompanied by some surprise visitors. Read the article here. A young baseball phenom has received one of the sport’s highest honors — recognition from the National Baseball Hall of Fame for pitching not one, but two perfect games. And while a perfect game — defined as one in which the pitcher allows no hits and no walks — is a rare occurrence for the sport, what makes this 13-year-old pitcher’s feat even more impressive is that she did it against the boys. Chelsea Baker, once a student of former major league pitcher Joe Niekro, last week donated the jersey she wore to pitch one of those special games to the Hall of Fame in Cooperstown, New York. The jersey will be part of an exhibit dedicated to the importance of women in the sport, according to the museum. Chelsea, who until recently honed her pitching arm in Plant City, Florida’s Little League program, told CNN Sunday that she feels “really honored and blessed” to be recognized on a national level at such an early age. In addition to her Hall of Fame achievement, Chelsea was also recently featured on ESPN’s “E:60” series. Chelsea, who says she has been pitching since she was 7 years old, boasts a fastball in the mid-60s (miles per hour) and a baffling knuckleball that has been known to make her male opponents shed a tear. It’s a pitch that was perfected with help from Niekro, who was her team’s batting pitcher before his death in 2006. “He would always throw it to us and I could never hit it, and so I’d always beg him to teach it to me and finally one day he just taught it to me,” she says. Chelsea is now participating in Baseball for All — an organization that advocates for women in the sport — playing on a touring all-girls team made up of players from around the country. And Chelsea says her career is only getting started. CNN’s Don Lemon contributed to this report.